The New Porridge is all about creating a nutrient-dense meal in one bowl – the comforting kind you look forward to eating when you get out of bed in the morning. 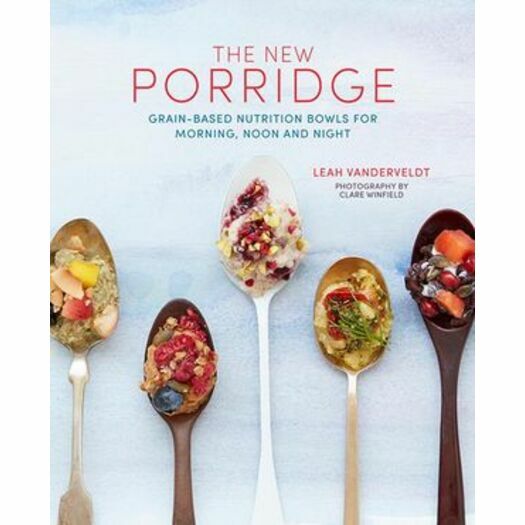 Nutrition and wellness expert Leah Vanderveldt brings you 55 inventive porridge recipes including some with eggs and dairy but plenty of vegan and vegetarian options too. The book begins with an introductory section with tips and tricks for making perfect porridge and an ingredient directory for superfood add-ons and protein boosts. This is followed by essential basic recipes for nut and plant-based milks and nut butters which are used throughout the book. A chapter on creative toppings gives you plenty of options for mixing and matching and adding various textures to your bowls. The main recipe begin with the Sweet & Warming chapter, featuring the more traditional versions of porridge in Western countries, with flavour combinations that take advantage of seasonal fruit and warming spices for natural sweetness, and nuts and seeds for texture. Recipes include Cinnamon Apple Pie, Coconut and Mango and Stewed Rhubarb Crumble Porridge. Next up is Savory and Cozy - savory porridge is a great meal for any time of the day. This chapter features both traditional interpretations of porridge (like Asian congee and Italian risotto) and versions that incorporate different vegetables and cuisines. Try the Shakshuka Porridge with Tomatoes Chilli and Eggs or the Red Lentil Risotto with Peas, Asparagus and Lemon. The final chapter, Cold & Make Ahead, is full of summertime versions of porridge. Bircher muesli, chia pudding, and fruit blends make this refreshing chapter the key to enjoying porridge all year around. Leah Vanderveldt is a food writer and recipe developer in the health and wellness space. She began her career at Conde Nast, working for both Vogue and Vanity Fair. When she moved to Sydney, Australia, Leah went on to become the food editor at health and wellness website, MindBodyGreen where she wrote and developed whole-food recipes and edited content about nutrition. She is certified in Culinary Nutrition from the Natural Gourmet Institute in New York City, where she learned to unite nutrition theory with practical techniques in the kitchen. She currently lives in Brooklyn with her husband, Fabian.